Yep, it’s official! You can uncross those fingers!! On Tuesday [6.28], Governor Gina Raimondo signed House Bill 8100 Substitute B and Senate Bill 3053 Substitute A which, as you certainly must know by now, will allow breweries to sell 288 ounces of beer for off-premise consumption [in any combo of growlers, bottles, and cans — a significant increase from the former 72-ounce limit] and sell 36 ounces in-house, and the state’s distilleries to sell spirits [750ml to-go and 4.5 on-site]. 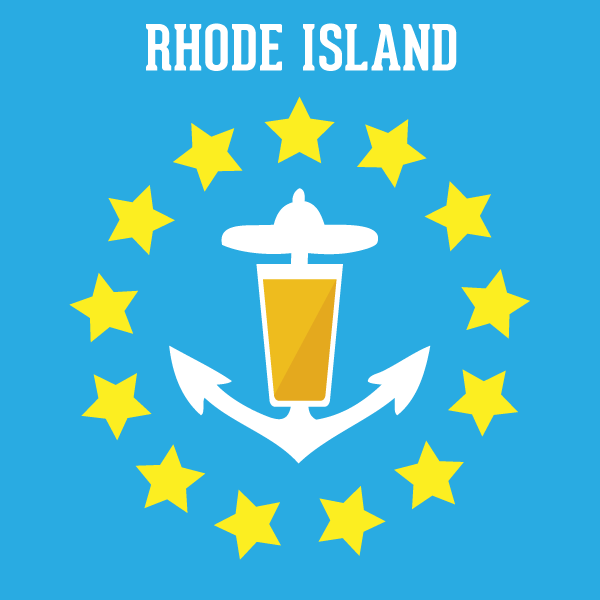 [Scroll down to read the thousands of posts we’ve made charting the bill’s progress; and click here to read “Growlers and beyond: raising the beer bar in Rhode Island”; this is the final time that we’ll link to it, honest!]. We’ve been badgering all of the Rhody brewers to find out how the new law would immediately impact their establishments. Three  of them responded; the post will be updated if/when more intel trickles in. OK, let’s roll the words from Our Favorite B&C Correspondents! Proclamation Ale Company: “With the passage of bill 8100 Sub B, we are now allowed to pour beers for sale in our tasting room, therefore we will be making some changes to how we do tastings at the brewery. First off, we will not be pouring ‘tastings’ anymore, where we pour samples of 4 or 5 beers on tap. We will now be serving limited 5-oz. ‘flight pours,’ 8-oz. half pints, and very occasionally 12-oz. tulips of our super-low ABV beers (anything 5% and below). Prices for each pour will be designated by beer. “The most exciting thing about the changes to the laws is it gives us a reason to have special barrel blends and one offs on at the brewery much more (for in-house only, no take home), as well as doing small keg runs of our sour/special releases to have on for pours at the brewery. (Pours of Alpaca? Yes, please.) We will also down the road introduce the ability to purchase some of our cellared beers from past releases for in-house consumption. Exciting. Tilted Barn Brewery: “We’ll keep this short and sweet and get right to it. Starting this Saturday, July 9 were going back to every Saturday from 1-4. Finally. And! Starting next week (July 15) we’ll be doing Friday nights every week as well. That’s right, Friday nights from 5-8 and Saturday afternoons from 1-4 every week. Construction of the new system was a bit delayed but is back on schedule. Once we finally get everything online we may add another night as well. Stay tuned. “We’re going to do our best to make sure we have enough beer every Friday and Saturday. We’ve bought a few more two-barrel tanks to bridge the gap until the bigger system comes and we’ve been cranking out batches in preparation. We’re going to hold enough beer back on Friday nights to get through Saturday. So there’s a chance that we may be out of beer for fills late on Fridays, but we’ll make sure to always have multiple beers on for tastings at least. This way we can make sure to have plenty of beer for the busy Saturday crowds. We’ll also keep our social media pages updated if we run out of beer for fills, so check before you come. You can celebrate the new law today — and cart away 288 ounces of fresh beer!! — at Grey Sail [growler station open 4-7 pm; the Tap Room is pouring from 3-8] and Long Live Beerworks [open 4-9 pm]. Click on our handy “Breweries & Brewpubs” links for hours, what’s on tap, and other pertinent data re: the other establishments. Thanks to all the reps, senators, officials, industry people, customers, loudmouthed individuals, dogs, cats etc etc…oh wait, someone already said that. So, simply: cheers! And now, dear readers, we’re going to back away from the B&C desk for a bit. During the hiatus, we’ll be launching a Kickstarter campaign to fund our book about the history of the Genesee Brewing Company. Rochester, NY, here we come! But if we snag some breaking news in the meantime, we’ll certainly break it; our next scheduled post will be on July 14 or 15, when we’ll share the beer list for the Craft Brew Races event, which is at Fort Adams State Park on Saturday, July 16. See ya then! It’s official! Gov. Raimondo signed the better beer law!! In January 2015, Narragansett Beer announced its H.P. Lovecraft Series, a year-long celebration of the author and the brewery — both born in 1890. ’Gansett prez Mark Hellendrung wrote, “When the brewery was shut down, the spirit of Narragansett never died; it went underground, to a deep and dark place. Since reclaiming our beer in 2005, we’ve worked hard to stay true to our roots. But after being in that dungeon for so long, we came back with some baggage. Just like the nameless protagonist from ‘The Outsider,’ we emerged in the light a little different. A little…strange. Think of this brew as our bold, our obscure, our tampered-with mind. It won’t be for everyone, and if it isn’t for you, you’ll know exactly who it IS for. This is OUR Lovecraft.” A few months ago, Hellendrung announced that the spirit of Narragansett would be revived in Pawtucket. 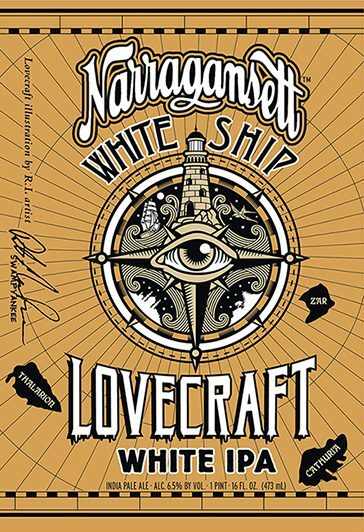 So: the fifth edition of the Lovecraft Series will be White Ship, a white IPA [6.8% ABV]. The beer was inspired by the 1919 short story “The White Ship,” which the ’Gansettites describe as “a fantastical tale of a man’s adventure aboard a mysterious ship, but his curiosity and greed win out over his better judgement.” As to what’s in the tallboy can [which boasts a striking design by artist Pete McPhee]: “This Belgian-style IPA is brewed with four different types of Belgian and American malts. A crisp IPA with a creamy Belgian yeast profile makes this a delicious, world-class beer that blurs style guidelines. El Dorado and Mandarina Bavarian hops impart a tangerine flavor associated with ‘white ales.’ Dry hopped with El Dorado to enhance the mildly fruity aromatics.” White Ship is expected to hit the market in early July. And get ready for the seasonal return of Town Beach. The sessionable IPA [4.7%], made with Hallertau. Nugget, and EKG hops and dry-hopped with Citra, should be shipping next week. It’s official: ‘Assembly OKs limited retail sales by breweries and distilleries’! The finish line has been crossed. 2016-H 8100B and 2016-S 3053A “passed the General Assembly yesterday [June 17] and will now go the governor’s desk.” Huzzah! As we noted on June 15, “the Governor does not necessarily need to sign every bill. Bills can become law without a signature under two conditions: If the bill is transferred to the Governor during the General Assembly session, it can become law after six days. If the bill is transferred to the Governor after the General Assembly adjourns, it becomes effective after 10 days.” The latter scenario is in play. STATE HOUSE – The General Assembly has passed legislation sponsored by Rep. Michael A. Morin and Sen. V. Susan Sosnowski to allow breweries and distilleries to sell limited amounts of their products to visitors for sampling and off-site consumption. The bill passed the General Assembly yesterday and will now go to the governor’s desk. The sponsors introduced the bill to assist Rhode Island’s growing brewery and distillery industries and to encourage an increasingly popular segment of the tourism industry. “I see this primarily as a way to help small businesses that have some really terrific potential. Getting their products into consumers’ hands is critical if they are going to become known and gain a following. It’s also a way to encourage tourism, since there are enough in each area of the state for enthusiasts to make a day of it, visiting breweries or distilleries, sampling products, and buying some to take home for later. Our laws should encourage the growth of small businesses and new industries, and I’m proud to help make this change,” said Representative Morin (D-Dist. 49, Woonsocket), whose district in Woonsocket is home to Ravenous Brewing Company. Although wineries in Rhode Island are allowed to offer samples and retail sales of their products, under current law, distilleries and breweries are banned entirely from selling their products at retail at their plants. The legislation (2016-H 8100B, 2016-S 3053A) allows breweries and distillers to sell up to 288 ounces of malt beverages and 750 mL of spirits per day at retail to each visitor for consumption off the premises, in containers no larger than 72 ounces each. Additionally, it would enable them to sell up to 36 ounces of malt beverages or 4.5 ounces of distilled spirits per day to each visitor for consumption on the premises, allowing visitors to sample their products before purchasing. The limits are designed to allow visitors to sample a variety of products and take home up to the equivalent of four six-packs of 12-ounce bottles, while also accommodating growlers, the larger jugs popular among craft beer aficionados. Both legislators worked closely with the manufacturers in their districts to craft the legislation. Dorian Rave, the owner of Ravenous Brewing Company in Woonsocket, said being able to let visitors sample and leave with his products is critical to building his brand, and without that ability, it’s hard to attract visitors and spread awareness of his company. The legislation is cosponsored by Rep. Stephen M. Casey (D-Dist. 50, Woonsocket), Rep. Jean Philippe Barros (D-Dist. 59, Pawtucket), Rep. Teresa Tanzi (D-Dist. 34, South Kingstown, Narragansett) and Rep. Kathleen A. Fogarty (D-Dist. 35, South Kingstown), Sen. Dennis L. Algiere (R-Dist. 38, Westerly, Charlestown, South Kingstown), Sen. Adam J. Satchell (D-Dist. 9, West Warwick) and Sen. Maryellen Goodwin (D-Dist. 1, Providence). Representative Morin added that he wished to thank and commend Rep. Joseph Solomon (D-Dist. 22, Warwick) for his work on an earlier bill that closely mirrors the one passed yesterday. • We have a big giveaway for you, dear B&C habitués! 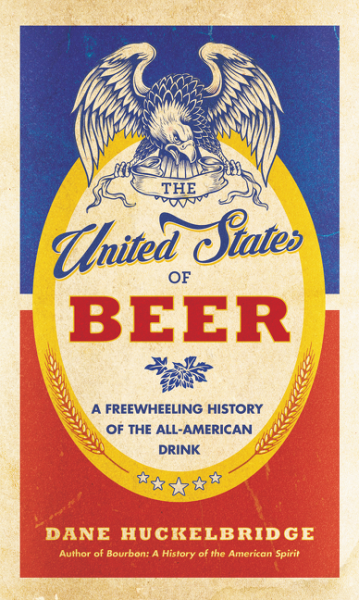 You could win one  of three  copies of the just-released book, The United States of Beer: A Freewheeling History of the All-American Drink, by Dane Huckelbridge. Dane is an expert re: all things fermented and distilled; his previous book was Bourbon: A History of the American Spirit [2014; his debut novel, Castle of Water, will be published in 2017]. Equally irreverent and revealing, Dane Huckelbridge’s masterful cultural history charts the wild, engrossing, and surprisingly complex story of our favorite alcoholic drink, showing how America has been under the influence of beer at almost every stage. From the earliest Native American corn brew (called chicha) to the waves of immigrants who brought with them their unique brewing traditions, to the seemingly infinite varieties of craft-brewed suds found on tap today, beer has claimed an outsized place in our culture that far transcends its few simple ingredients — water, barley, and hops. And yet despite its ubiquity — Americans consume some six billion gallons of beer each year — the story of beer in the USA is as diverse and fascinating as the country itself, overflowing with all the color and character of America’s many peoples and regions. A brewery was among the first orders of business when the Pilgrims landed at Plymouth Rock, and George Washington tried (but mostly failed) to produce beer at Mount Vernon. Since 1776, America has operated under the principle of E. Pluribus, Brewdog: out of many regional brews, one nation of beer drinkers. The first “macrobrew” revolution was in the Midwest, where an influx of German immigrants in the 1800s changed American brewing forever. Bavarian newcomers brought their now-universal lager to St. Louis, Milwaukee, and the rest of the heartland; Busch, Pabst, and Schlitz soon followed, establishing the first great beer empires and ushering in a golden age of brewing that would last into the twentieth century. Then in 1920, Prohibition threatened the very existence of beer in America. Brewers were forced to diversity into a variety of odd products — among them malted milk, porcelain, and cement — in order to survive. When the spigot finally reopened in 1933, many breweries were tapped out. By the early 1980s, a country that once boasted more than a thousand breweries was down to a few dozen, with little to distinguish among them. But stirred by the American entrepreneurial spirit, a cadre of daring young trailblazers decided our options shouldn’t be limited to watery, flavorless macrobrews. The microbrew movement began on the West Coast, but quickly spread: today there are thousands of craft breweries, scattered across all fifty states. Drawing upon a wealth of little-known historical sources, explaining the scientific breakthroughs that have shaped beer’s evolution, and mixing in more than a splash of dedicated on-the-ground research, The United States of Beer offers a raucous and enlightening toast to the all-American drink. We’re going to start absorbing the enlightenment in our copy of The United States of Beer ASAP. Do you wanna win a copy? It’s e-z [updated on 6.16 @ 1:55 pm]: send an email to bottlescansclaphands@yahoo.com with the subject line: “I WANT TO WIN THE UNITED STATES OF BEER.” The inbox will close ’round sundown on Sunday [6.19]; one  lucky winner will be randomly selected and receive the book via the USPS. Two  books will be given away on Saturday [6.18] at the new Grey Sail Tap Room; we’ll drop the approximate time of the Big Giveaway on Twitter on Saturday ’round noon [so, hint-hint, follow us!]. In the meantime, get a taste of Dane’s deep dive into your favorite beverage: click here for a lengthy sample from the book’s prologue and first chapter. Cheers! • On May 26, we wrote about New Belgium Brewing would be making its debut in Rhode Island on June 20. The initial offerings from the Fort Collins, CO/Asheville, NC beermaker will be hitting shelves and coolers on Monday, but the beers have already hit a few tap lines around the state. There are two official Big New Belgium Kickoff Events. First up: on Friday [6.17] from 7-9 pm at the Wild Colonial [250 South Water St, Providence]; the lineup includes the flagship Fat Tire Amber Ale, Ranger IPA, and Fat Funk Ale, a collab with Allagash from the Fat Tire & Friends CollaBEERation project. On Tuesday [6.21] from 7-9 pm at Pizza J [967 Westminster St, Providence], the offerings include Citradelic Tangerine IPA, Rampant IIPA, Fat Funk Ale, and Fat Wild Ale [made with Avery Brewing]. • The Craft Brew Races extravaganza will take place on Saturday, July 16 at Fort Adams State Park. The event features a 5K walk/run followed by a brew fest [12:30-4 pm] featuring 38 breweries [including a dozen RIers] and ciderists. Today [6.16] is your last chance to get early bird tickets: $50 for 5K/fest, $40 fest. At midnight, they’ll cost $55 and $45 [and will be $65 and $55 onsite]. Click here for alla the details. • The new issue of Motif is a “Foodie Guide.” So we asked five local beer-and-food savants to talk perfect pairings. Click here [or here for the virtual magazine experience] to dig into the input from Brian Oakley [Julians, Pizza J], David Dadekian [Eat Drink RI], Sam Glynn [Chomp and Statesman Tavern], Ky Bessette [Rogue Island], and Sean Larkin [Revival and Brutopia]. Go read it! Here’s the latest report on the progress of the better beer laws [it’s a tad convoluted, but that’s how the sausage is made]: Today [6.15], the Senate passed the updated House bill H8100 Sub B, with a vote of 35-2. The legislation — which will allow breweries to sell 288 ounces of beer for off-premise consumption [in any combo of growlers, bottles, and cans — a significant increase from the current 72-ounce limit] and sell 36 ounces in-house, and the state’s distilleries to sell spirits [750ml to-go and 4.5 on-site] — is now back in the House, for their approval of the changes that the Senate made to the House bill that was passed on May 19 — i.e., revising the on-site taproom sales authorization from the 48 ounces in the original House bill to the now-agreed-upon 36 ounces. As we noted on Tuesday, both bills will likely be voted out of committee on Thursday [6.16] and move to the floor for a full House vote late Thursday or Friday [6.17], depending on the length of the House calendar. The bills are now identical and there is no opposition; it is now just a procedural process to get them past the finish line. But it may be a few more weeks before the changes take effect. When the House adjourns its session — which could be late Friday night or 2 a.m. on Saturday morning — bills would not likely be transferred to the Governor until the following Monday or later. There is no set time during which a bill must be reported to the Governor for signature, although it must be done at some point upon passage of both Chambers and upon order from the Speaker of the House or the Senate President. Both chambers can take their time to transfer bills to the Governor. Given the volume of bills passed during the end of session, the transmittal to the Governor can take days to complete. And the Governor does not necessarily need to sign every bill. Bills can become law without a signature under two conditions: If the bill is transferred to the Governor during the General Assembly session, it can become law after six days. If the bill is transferred to the Governor after the General Assembly adjourns, it becomes effective after 10 days. The GA hopes to wrap up its business on Friday [6.17]. So: all systems go. But be patient. And keep those fingers crossed…. This just in: At 6:21 pm, the Senate approved S3053 Sub A — 37 yeas, 0 nays — which will allow breweries to sell 288 ounces of beer for off-premise consumption [in any combo of growlers, crowlers, bottles, and cans] and sell 36 ounces in-house [the bill also helps the state’s distilleries, greenlighting sales of spirits: 750ml to-go and 4.5 on-site]. Huzzah! UPDATE [@ 8:35 pm]: There’s another hoop [or two] to jump through. The bill that passed the House on May 19 included a 48-ounce limit for on-site sales. The House bill — amended to reflect the Senate version– was voted out of committee this evening. It will likely be posted to the Senate calendar on Wednedsday [6.15] for a vote by the full Senate and sent back to the House. At this point, the House will assign both the Senate and House bills to committee for another hearing/vote. Both bills will be voted out of committee on Thursday [6.16] and move to the floor for a full House vote late Thursday or Friday [6.17] pending on the length of the House calendar. The good news is that the bills are identical and there is no opposition; it is now just a procedural process to get them past the finish line. So, still: huzzah! We’re hoping that Governor Raimondo signs the bill as soon as it crosses the finish line, so the state’s brewers can grow their businesses by selling — and making more of — their finely-crafted fare. Keep your fingers crossed until the ink dries on the document. Then raise a glass in celebration! Thanks to all who supported the push for the passage of better beer laws. In 2017, let’s rally to raise the beer bar even higher; check our “Growlers and beyond” piece from 5.22.15 for a few items to add to the next legislative wish list.